Every semester, our projects team works hard on consulting or independent research. Listed here are a collection of all the reports that we can publish online, or a summary of what we worked on. Abstract: This research creates a classification-based model that predicts the salary amounts given to NBA players in free agency. This was done through collecting player salary data through Spotrac and player statistics through Basketball Reference. Correlation analysis demonstrated that points, turnovers, VORP, and rebounds created a balanced and effective set of variables for unweighted KNN-classification. The former three statistics were standardized by year, while the latter statistic was standardized by year and position due to underlying relationships between those categories. 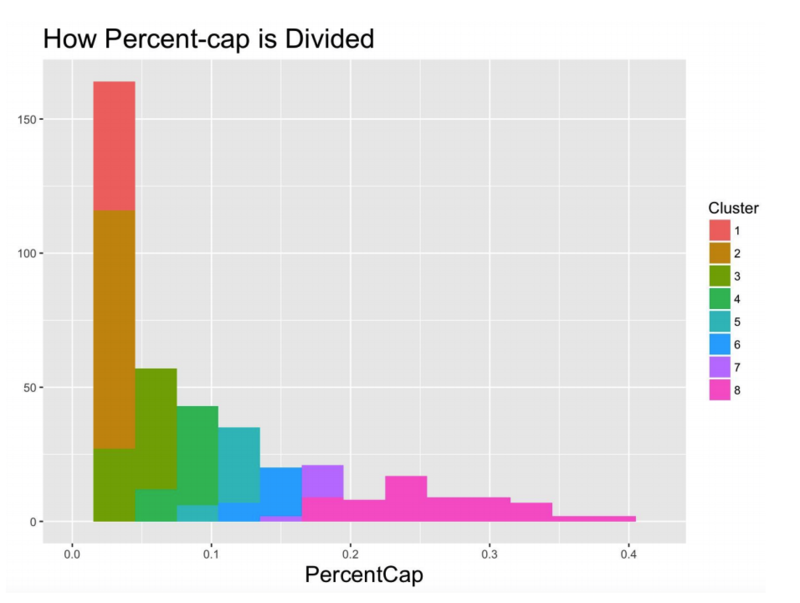 After classification, the model revealed that volume statistics were most indicative of salaries within lower and mid-level players, while high VORP was common among all players making near-max to max salaries. Using test set data, the model was off by 1.21 clusters on average, but many outliers were due to gross over and undervaluation on the part of the franchises. The model was used to predict salaries for incoming free agents in the 2018 class, with reasonable projections that meet qualitative expectations. Click for the full report! 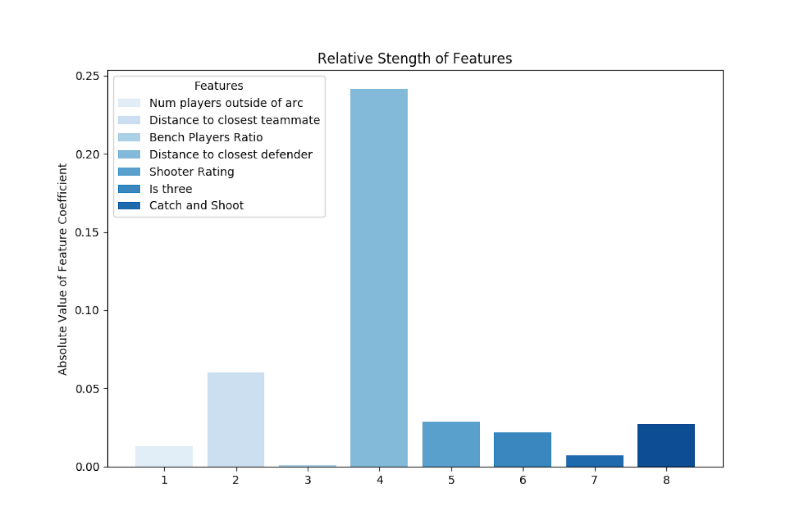 Abstract: We present a shot classifier for the NBA trained on positional player data and player ratings data that classifies a shot attempt into a make or a miss. This classifier has an accuracy of 56.23% on test data, and the precision, recall, and f1­-score of our classifier was 0.54, 0.56, and 0.51 respectively. We also present a shot evaluator as an extension of this classifier that outputs a value, 0 to 1, corresponding to the efficiency of a shot. The evaluator was created using a combination of the probability values of our classifier and the type of field goal attempt. Click for the full report! Abstract: This case analyzes the concession pricing for the San Jose Earthquakes, and gives recommendations as to how the pricing schemes can be better. The analysis includes how to best align the pricing such that the team profits from their concessions. This project was done as a consulting project with the San Jose Earthquakes. Click for the full report! Abstract: This research creates and offers a new metric called Free Agency Rating (FAR) that evaluates and compares franchises in the National Football League (NFL). FAR is a measure of how good a franchise is at signing unrestricted free agents relative to their talent level in the offseason. This is done by collecting and combining free agent and salary information from Spotrac and player overall ratings from Madden over the last six years. 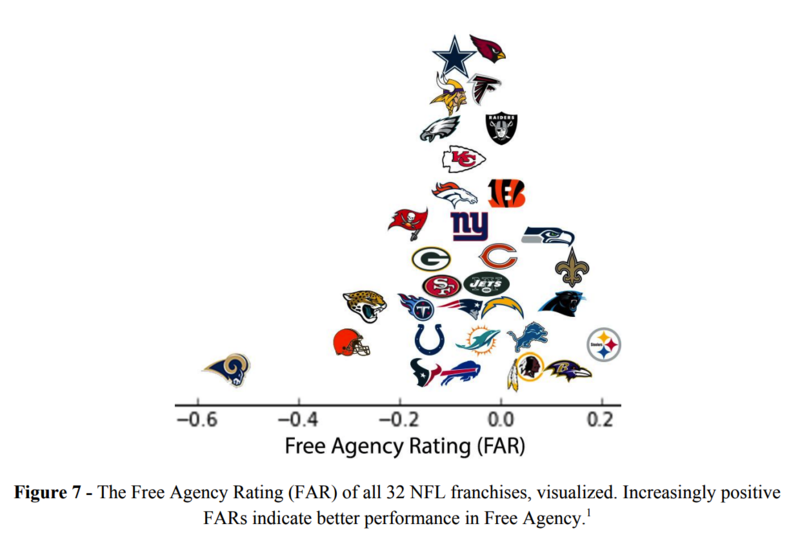 This research allowed us to validate our assumptions about which franchises are better in free agency, as we could compare them side to side. It also helped us understand whether certain factors that we assumed drove free agent success actually do. In the future, this research will help teams develop better strategies and help fans and analysts better project where free agents might go. The results of this research show that the single most significant factor of free agency success is a franchise’s winning culture. Meanwhile, factors like market size and weather, do not correlate to a significant degree with FAR, like we might anticipate. Click for the full report!